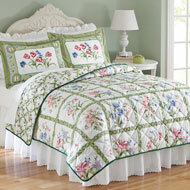 This beautiful quilt features a delicate floral pattern print that will brighten any bedroom décor. 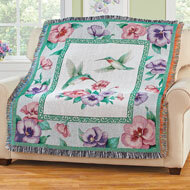 Reversible quilt has an allover lattice design on the back that adds the finishing touch. Available in either blue or green colorways. Machine washable polyester. 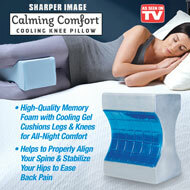 Available in sizes, Twin (64" x 86"), Full/Queen (86" x 86"), or King (102" x 86"). Exquisitely designed, heirloomquality quilt features beautiful embroidered tulips and swirling vermicelli stitching for a luxurious showcase in your bedroom. The stunning woven quilt features tulips and lovely floral prints in shades of yellow, green and blue. The reverse side has a small floral print, and bluetrimmed edges add the finishing touch. Imported in soft, machine washable polyester/cotton. Sizes available in Twin (68" x 86"), Full/Queen (86" x 86"), or King (100" x 90"). This beautifully designed quilt will instantly brighten your bedroom décor. Flowering branches and fluttering butterflies in shades of blue and green cover it in beautiful color while the scalloped edges add a touch of elegance and style. Reverse side is solid white. Machine washable polyester; imported. Choose: Twin (86" x 68"), Full/Queen (86" x 86"), or King (86" x 102"). 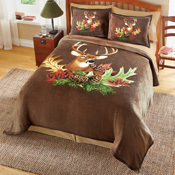 Warm and cozy Ultraplush fleece coverlet features a beautiful scene with a majestic buck surrounded by fallcolored leaves and pinecones. Rich brown background complements the gorgeous colors on this comfy coverlet. Machine washable polyester. Sizes available in Full/Queen (90"L x 90"W), or King (102"L x 90"W). 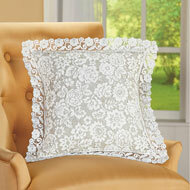 This pillow cover features a beautiful floral lace pattern and has a zipper on the back to insert your 17" pillow form (sold separately). Machine washable. Polyester; imported. 17"Sq. Beautiful colors and a delightful garden design featuring bright hummingbirds make this throw a wonderful addition to any room in your home. Pansies in pink and purple border the edges and bloom in the center while hummingbirds flutter above. Green borders and multicolor fringe are the perfect finishing touches. Machine washable. Polyester and cotton; imported. 60"L x 50"W.